I was on a mission to spend as much time in Washington as I could with the little amount of time that I had. When booking my plane tickets I made sure to pick the earliest flight out and the latest flight back. That meant getting up much too early and staying up much too late :) but it would all be worth it. The plan was to make it to Olympic National Park in order to adventure around and see new things. I have always wanted to go to this park and I was finally making it happen! Getting up at 4:00 am in order to make the flight was a little rough, I am not going to lie. Once the plan touched down in Seattle it was off to renting a car, then getting on a ferry, and then traveling up to Olympic National Park. Olympic National Park was more amazing than i ever expected. 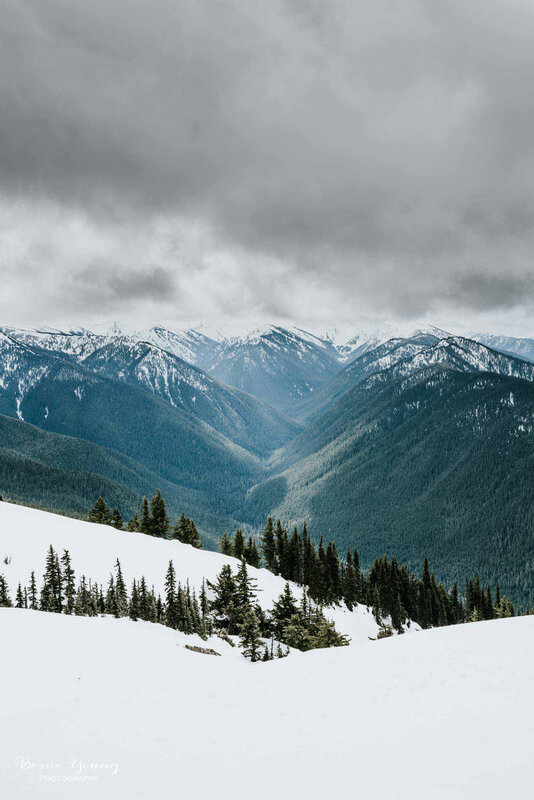 In order to get some of the best views of the mountains you need to travel up a road called Hurricane ridge road. This road meanders along the ridge of the mountains and ends at a dead end. I was beyond thrilled to see snow capped mountains. It even started to snow on me while I was up at the top of the mountain :) Talk about amazing. The next stop within Olympic National Park was Sol Duc Falls, but as I drove to the trail head I passed a 'Waterfall trail head' sign. I decided to take a slight detour, be spontaneous, and hike a trail to an unknown waterfall. Man was it worth it! I even made a little friend along the way. This beautiful duck decided he wanted to hang out with me at the trail head while I got packed and ready to go. This trail took me to the Marymere Waterfalls. It was raining ever so slightly the entire walk. The tail was about 2 miles round trip and absolutely gorgeous. As I ventured further into the wild I was accompanied by the beautiful sound of the river almost the entire way. "Was that a fish?" I asked myself. I figured I might actually be loosing it a little bit and continued with getting my settings right on my camera. Then not but a 30 seconds later another jump, and then another, and another. "Those are fish!!!" I actually think I yelled it at that moment. Luckily there wasn't anyone around to see my little bit of crazy and all too excited self. This was an absolute treat. Fish trying to swim upstream! After I got my river shot I headed over to the rocks where the fish were jumping and got some awesome shots. It felt almost like I was in National Geographic :) All I needed was a big Grizzly Bear trying to catch the fish while they jumped out of the water. It started getting quite dark, so I had to head back to my hotel. Olympic National Park was absolutely amazing. I am so excited that I was finally able to travel up that way and mark this adventure off my bucket list. It was gorgeous, quite drizzly, amazingly green, and completely worth the trip. If you ever get a chance to go .... go and do it! I hope you all enjoyed this blog. If you did, don't forget to subscribe :) All my images are for sale in my shop. P.S. This area of Washington has a Lavender Festival! Yes, you read that right and you know what that means?.... I will be heading up that way sometime to catch the gorgeous fields in bloom. For this trip, I got some pretty neat shots of these little wild Quail.